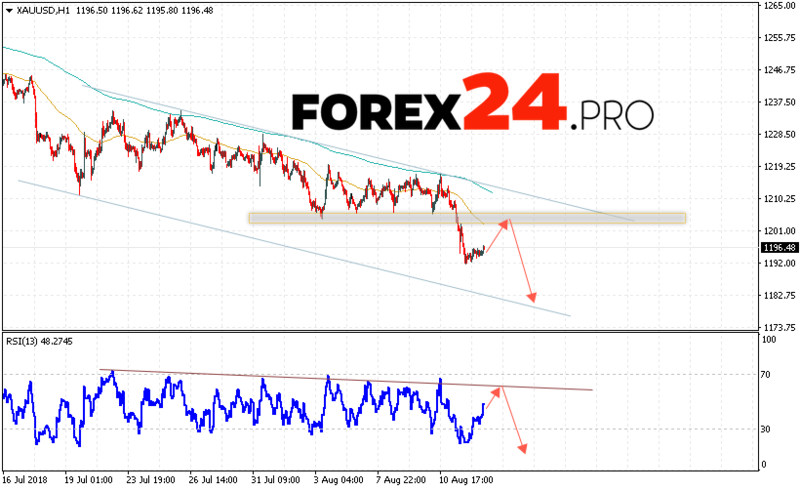 Quotes of GOLD continue to move within the bearish channel. At the time of publication of the forecast, the GOLD price is 1196 Dollars per Ounce. At this point, we should expect a test of the resistance level near the area of ​​1202. Where can we expect a rebound and the continuation of the fall in the price of gold with a target below the level of 1175. In favor of falling quotations XAU/USD will test the resistance line on the indicator of relative strength index (RSI), as well as rebound from the upper boundary of the bearish channel. The cancellation of the decline in the price of GOLD will be a strong growth and breakdown of the 1215 area, which will indicate the breakdown of the upper border of the channel and the continuation of growth to the level above the level of 1245. Expect the acceleration of the fall in quotations XAU/USD stands with the breakdown of the support area and the closing below the level of 1190, to complete the formation of the «Flag» model. XAU/USD forecast GOLD & analysis August 15, 2018 suggests an attempt to test the resistance area near the level of 1202 and the continuation of the fall of quotations below the level of 1175, the cancellation of the variant of falling prices for GOLD will be a breakdown of the level of 1215, which will indicate the quotes outflow down channel, in this case we should expect the continuation of growth in the area above the level of 1245.